The Maryville City Council approved the rezoning of a residential lot, despite the concerns of nearby neighbors during its regular meeting February 27. Brandon and Natasha Brand requested to rezone their R-2 lot that sits on the corner of West Third Street and North Walnut to an R-4 which would allow them to build a duplex on the property. Brand completed all the paperwork necessary and his design met all the requirements. Several neighbors were in attendance with concerns that once the property was rezoned to an R-4, additional adjoining properties would also be rezoned and the integrity of the residential neighborhood would be compromised. Other concerns included extra traffic in the alley behind the property, sewage issues and water runoff from the parking lot. The council approved the rezoning 4-1 with Jerry Riggs voting no. The duplex design calls for a two-story structure that will have eight bedrooms. The yard will have eight hard-surfaced parking spots. Representative Mike Williams from Hochschild, Bloom and Company, LLP, St. Louis, presented the annual audit reports. The city of Maryville paid $38,600 to conduct the fiscal year 2016 audit which came back with good results. Kenny and Nathalee Hull were awarded the contract to clean the city hall for $395 per month with an additional $45 to clean after each municipal court event. It was approved to accept the quitclaim deed for four parcels of land from the Missouri Department of Transportation in the area of the new slip ramp near Kawasaki. NW-0430 is a three-acre tract of vacant ground located between 285th Street and US Highway 71 and tract NW-0445 is located adjacent to the Kawasaki-owned property on the west side of 285th Street. The parcel identified as NW-0443 is the outer roadway of 285th Street from South Main Street to the entrance of Kawasaki Motors Manufacturing. Tract NW-0502 is the section of South Main Street from Highway V to the bypass on Highway 71. Acceptance of these tracts of land will allow city staff to control and maintain South Main Street. The St. Patrick’s Day Parade was approved and will be held at 5:17 pm, March 17 and will be hosted by Burny’s Sports Bar. The 300 block of North Market Street will be closed from 3:45 to 6 pm. Joyce Cronin presented photos of the four sculptures that have been chosen by the Maryville Public Art Committee to be displayed in the downtown area. The committee leases the sculptures for $1,500 a piece. Interested individuals can purchase the art. See the March 2 paper for photos of the art pieces. •Maryville Public Safety received a $2,500 grant from Wal-Mart to purchase a drone to be used for search and rescue efforts. 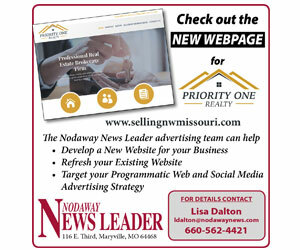 •City staff is in the process of applying for a $350,000 grant through the Missouri Department of Economic Development to contribute funding to the fire bay for a potential new public safety facility. •The structural improvements to the building on the corner of Third Street and Buchanan should be completed within the next four weeks. •The Watson 9 and golf pro Kyle Easter received the Maryville Middle School Golden Milkbone award. •City staff has been utilizing the concrete from the Northwest Missouri Regional Airport runway project as rip rap along the Mozingo shoreline. •The City of Maryville along with Ideker, Inc., and JViation received the Excellence in Concrete Pavement award for the airport runway project. •The conference center will allow booking beginning in April for dates after January 1, 2018.